The Dorset Horn is often referred to as the 'mother breed' of all sheep because of both their long history and their exceptional mothering characteristics. While the exact history is unknown, historians believe that the breed evolved from a cross between Spanish Merinos and horned sheep from the hills of Wales. This new breed, in which both males and females carry a handsome set of horns, became popular in the hills and valleys of southwest England, and become connected in name to the county of Dorset. A polled version was later developed, which pushed the Dorset Horn onto the American Livestock Breeds Conservancy's list of rare and endangered breeds. 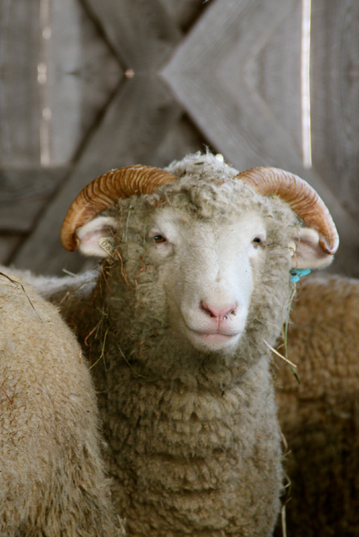 A moderately sized sheep that produces significant volumes of milk and wool and has the unique attribute of breeding at any time of year, the Dorset Horn is a great breed to be kept together with the Tunis and raised in Vermont.